GF End of the Year Launcher Competition! The End of the year season is here! And Grand Fantasia is no exception! - Must be about New Year 2019!! - Every submission to this contest can and will be used by Aeria Games for promotional purposes. - We reserve the right to disqualify any design that may breach the rules of the contest or our ToS! Now, is time to show your designs!! 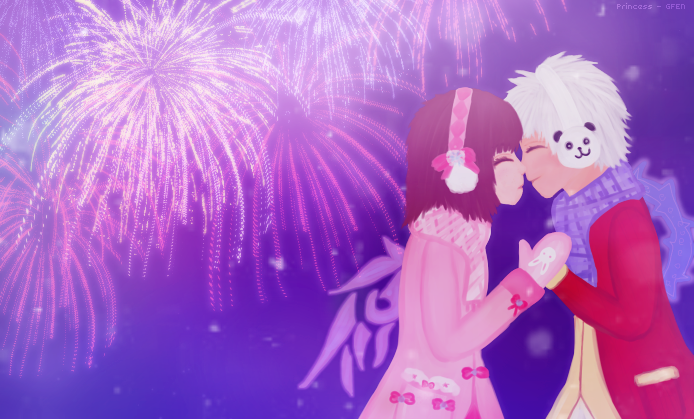 Here's a cute entry of a New Years Kiss. ♥ft.myfavouriteperson Click here for the gif version. Firework brushes are surprisingly fun but take awhile to make look good. The post was edited 1 time, last by Princess ( Jan 5th 2019 ).